Abstract: This work introduces faceted service discovery. 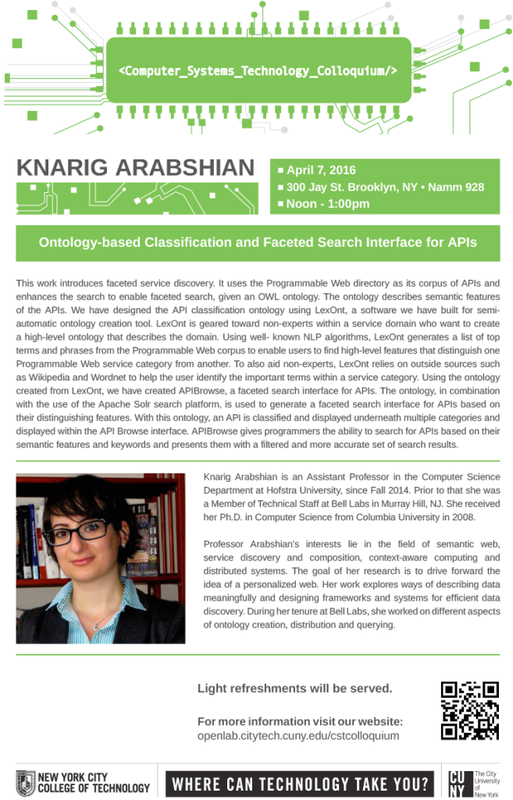 It uses the Programmable Web directory as its corpus of APIs and enhances the search to enable faceted search, given an OWL ontology. The ontology describes semantic features of the APIs. We have designed the API classification ontology using LexOnt, a software we have built for semi-automatic ontology creation tool. LexOnt is geared toward non-experts within a service domain who want to create a high-level ontology that describes the domain. Using well- known NLP algorithms, LexOnt generates a list of top terms and phrases from the Programmable Web corpus to enable users to find high-level features that distinguish one Programmable Web service category from another. To also aid non-experts, LexOnt relies on outside sources such as Wikipedia and Wordnet to help the user identify the important terms within a service category. Using the ontology created from LexOnt, we have created APIBrowse, a faceted search interface for APIs. The ontology, in combination with the use of the Apache Solr search platform, is used to generate a faceted search interface for APIs based on their distinguishing features. With this ontology, an API is classified and displayed underneath multiple categories and displayed within the APIBrowse interface. APIBrowse gives programmers the ability to search for APIs based on their semantic features and keywords and presents them with a filtered and more accurate set of search results. Abstract: Founded in 2010, NYC Media Lab is dedicated to driving innovation and ultimately job growth in media and technology by facilitating collaboration between the City’s universities and its companies. Comprised of a consortium including New York City Economic Development Corporation, New York University, Columbia University, The New School, CUNY, and Pratt Institute, NYC Media Lab’s goals include generating research and development, knowledge transfer, and talent development across all of the City’s campuses. 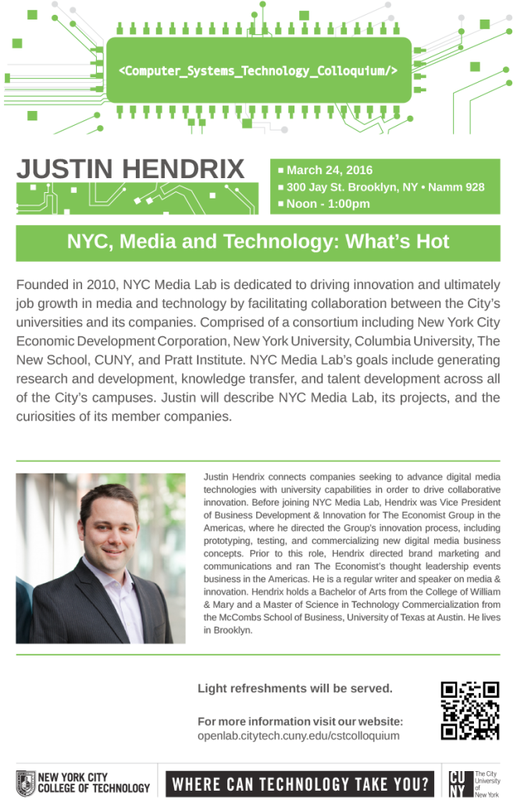 Justin will describe NYC Media Lab, its projects, and the curiosities of its member companies. Abstract: In our research, we analyze digitized images of Hematoxylin-Eosin (H&E) slides equipped with tumorous tissues from patient derived xenograft models to build our bio-inspired computation method, namely Personalized Relevance Parameterization of Spatial Randomness (PReP-SR). 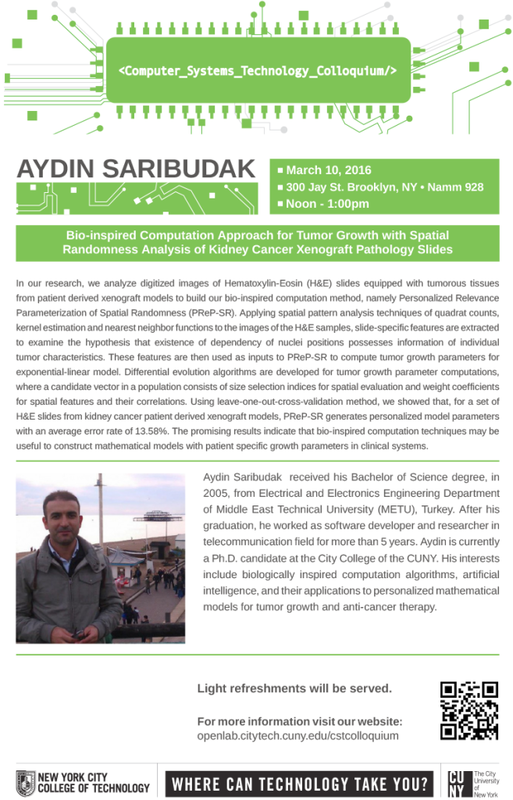 Applying spatial pattern analysis techniques of quadrat counts, kernel estimation and nearest neighbor functions to the images of the H&E samples, slide-specific features are extracted to examine the hypothesis that existence of dependency of nuclei positions possesses information of individual tumor characteristics. These features are then used as inputs to PReP-SR to compute tumor growth parameters for exponential-linear model. Differential evolution algorithms are developed for tumor growth parameter computations, where a candidate vector in a population consists of size selection indices for spatial evaluation and weight coefficients for spatial features and their correlations. Using leave-one-out-cross-validation method, we showed that, for a set of H&E slides from kidney cancer patient derived xenograft models, PReP-SR generates personalized model parameters with an average error rate of 13:58%. The promising results indicate that bio-inspired computation techniques may be useful to construct mathematical models with patient specific growth parameters in clinical systems. Abstract: Most tools that scientists use for the preparation of scholarly manuscripts, such as Microsoft Word and LaTeX, function offline and do not account for the born-digital nature of research objects. Also, most authoring tools in use today are not designed for collaboration, and, as scientific collaborations grow in size, research transparency and the attribution of scholarly credit are at stake. 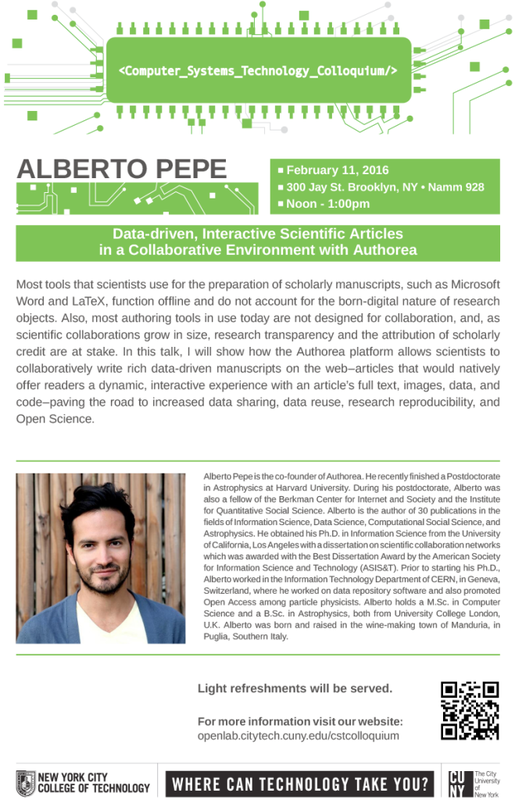 In this talk, I will show how the Authorea platform allows scientists to collaboratively write rich data-driven manuscripts on the web–articles that would natively offer readers a dynamic, interactive experience with an article’s full text, images, data, and code–paving the road to increased data sharing, data reuse, research reproducibility, and Open Science. Abstract: Cardiotoxicity is unfortunately a common side effect of many modern chemotherapeutic agents. The mechanisms that underlie these detrimental effects on heart muscle, however, remain unclear. The Drug Toxicity Signature Generation Center at ISMMS aims to address this unresolved issue by providing a bridge between molecular changes in cells and the prediction of pathophysiological effects. I will discuss ongoing work in which we use next-generation sequencing to quantify changes in gene expression that occur in cardiac myocytes after they are treated with potentially toxic chemotherapeutic agents. I will focus in particular on the computational pipeline we are developing that integrates sophisticated sequence alignment, statistical and network analysis, and dynamical mathematical models to develop novel predictions about the mechanisms underlying drug-induced cardiotoxicity. Jaehee Shim is a Ph.D candidate in the Biophysics and Systems Pharmacology Program at Icahn School of Medicine at Mount Sinai (ISMMS). As a part of her Ph.D. studies, she is building dynamical prediction models based on analysis of gene expression data generated by the Drug Toxicity Signature Generation Center at ISMMS. She received her B.S in Biochemistry from the University of Michigan-Dearborn. Prior to starting her Ph.D, Jaehee worked at the ISMMS Genomics Core with a team of senior scientists and gained experience in improving and troubleshooting RNA sequencing protocols using Next Generation Sequencing Platforms. Abstract: Bayard Rock, LLC, is a private research and software development company with headquarters in the Empire State Building. It is a leader in the filed in the research and development of tools for improving the state of the art in anti-money laundering and fraud detection. As you might imagine, these tools rely heavily on mathematics and graph algorithms. In this talk, Richard Minerich will discuss the research activities of Bayard Rock and its approaches to build tools to find the “bad guys”. 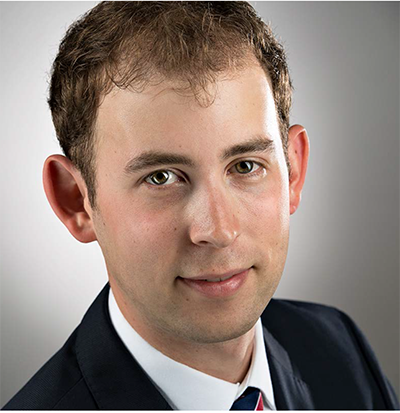 Richard Minerich is Bayard Rock’s Director of Research and Development. Rick has expertise in F#, C#, C, C++, C++/CLI,. NET (1.1, 2.0, 3.0, 3.5, 4.0, and 4.5), Object Oriented Design, Functional Design, Entity Resolution, Machine Learning, Concurrency, and Image Processing. He is interested in working on algorithmically, mathematically complex projects and remains open to explore new ideas. Recent years have seen the emergence of several static analysis techniques for reasoning about programs. This talk presents several major classes of techniques and tools that implement these techniques. Part of the presentation will be a demonstration of the tools. Dr. Subash Shankar is an Associate Professor in the Computer Science department at Hunter College, CUNY. Prior to joining CUNY, he received a PhD from the University of Minnesota and was a postdoctoral fellow in the model checking group at Carnegie Mellon University. Dr. Shankar also has over 10 years of industrial experience, mostly in the areas of formal methods and tools for analyzing hardware and software systems. Abstract: With the proliferation of testing culture, many developers are facing new challenges. As projects are getting started, the focus may be on developing enough tests to maintain confidence that the code is correct. However, as developers write more and more tests, performance and repeatability become growing concerns for test suites. In our study of large open source software, we found that running tests took on average 41% of the total time needed to build each project – over 90% in those that took the longest to build. Unfortunately, typical techniques for accelerating test suites from literature (like running only a subset of tests, or running them in parallel) can’t be applied in practice safely, since tests may depend on each other. These dependencies are very hard to find and detect, posing a serious challenge to test and build acceleration. In this talk, I will present my recent research in automatically detecting and isolating these dependencies, enabling for significant, safe and sound build acceleration of up to 16x. Jon is a fourth year PhD candidate at Columbia University studying Software Engineering with Prof Gail Kaiser. His research interests in Software Engineering mostly fall under the umbrella of Software Testing and Program Analysis. Jon’s recent research in accelerating software testing has been recognized with an ACM SIGSOFT Distinguished Paper Award (ICSE ’14), and has been the basis for an industrial collaboration with the bay-area software build acceleration company Electric Cloud. Jon actively participates in the artifact evaluation program committees of ISSTA and OOPSLA, and has served several years as the Student Volunteer chair for OOPSLA.